The African Journal of Range and Forage Science has shown exponential growth between 2014 and 2016, with the impact factor increasing from 0.971 to 1.25. The Journal is dedicated to publishing quality original material that advances rangeland ecology and pasture management in Africa and now also welcomes contributions reporting on research not undertaken in Africa, but which is theoretically and/or practically applicable to Africa. This expansion in aims and scopes hopes to see a growth in submissions from outside of Africa, keeping within an African theoretical and practical framework. The Journal promotes both science and its application and authors are encouraged to explicitly identify the practical implications of their work. Peer-reviewed research papers and research notes deal primarily with all aspects of rangeland and pasture ecology and management, including the ecophysiology and biogeochemistry of rangelands and pastures, terrestrial plant–herbivore interactions (both domestic and wild), rangeland assessment and monitoring, effects of climate change on rangelands, rangeland and pasture management, rangeland rehabilitation, ecosystem services in support of production, conservation and biodiversity goals, and the identification and development of intensive and semi-intensive pasture and forage resources to meet livestock production needs in Africa. 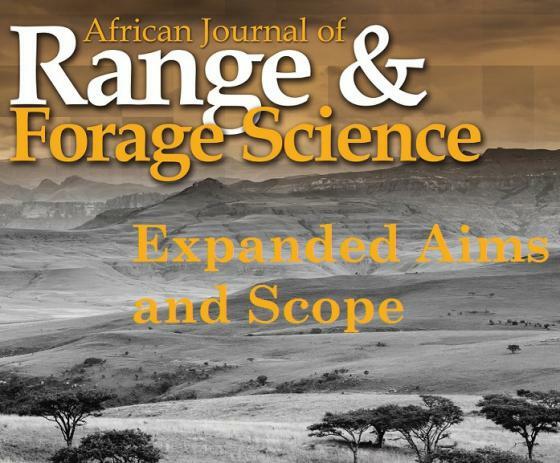 The African Journal of Range & Forage Science is the official journal of the Grassland Society of Southern Africa.